The silk we use hasn't been bleached, dyed or processed with chemicals. We use it in its purest natural form. Its then woven on hand looms by artisan weavers using exactly the same techniques their forefathers have used for centuries before them. The care and attention to detail that the weavers put in to their creation shows the greatest respect for the material they are working with. 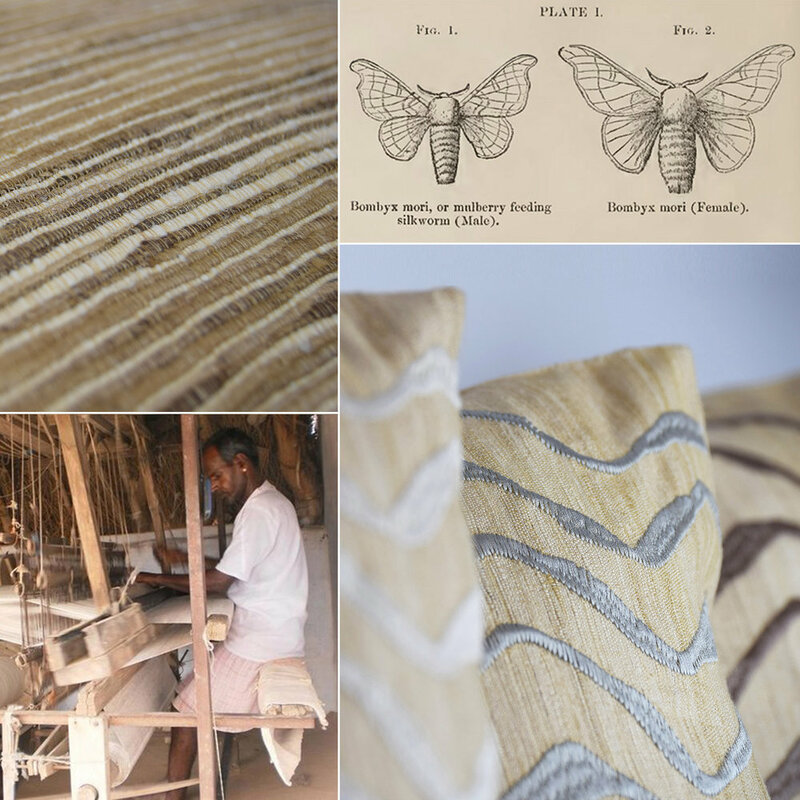 For us it adds to the allure of using silk in our cushions and in essence breathes a living soul into the fabric. The result is something truly beautiful. Like a human fingerprint, due to the very nature of its production, each metre of fabric made is unique. The natural slubs and differences in the colour tone of the raw silk add a naive charm. Natural variations in the yarn combined with the un-uniform weave created on hand looms give the cloth an "imperfect" elegance. We then take these creations and add a touch of modern styling to our cushions. Using either embroidered or printed techniques, taking great care with the design to ensure it enhances and does not distract from the beauty of the silk fabric. It may end up to some as a simple cushion, but to us it is so much more. Charm, elegance, history and a natural beauty that is all to often lost in the sterile manufacturing processes of the modern world we live in.